In 2014–15, photographer Reese Muntean worked with curator Jordan Wilson to develop visual and interactive media for the exhibition c̓әsnaʔәm, the city before the city. In the course of this collaboration, Muntean, Wilson, and members of the Musqueam Fisheries Commission documented the everyday salmon processing practices of community members on their reserve lands at the mouth of the Fraser River in Vancouver, on the unceded traditional territory of the hən̓q̓əmin̓əm̓-speaking Musqueam people. 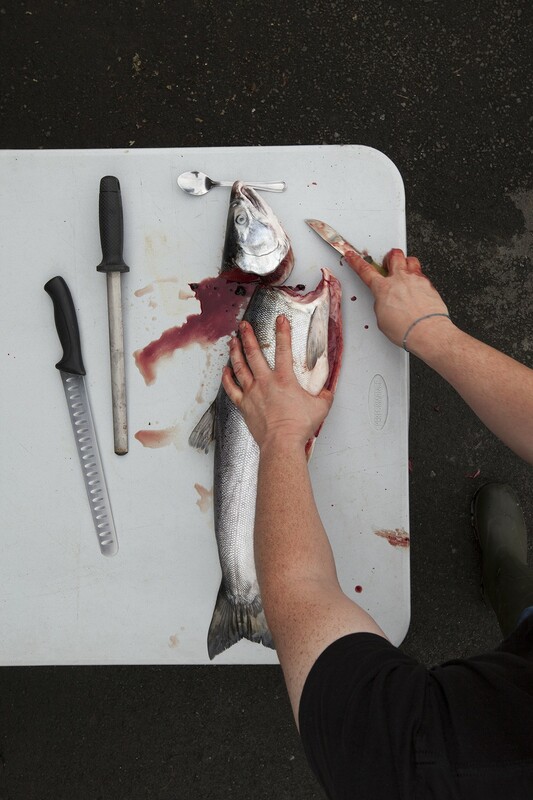 In addition to representing contemporary Musqueam fishers at work, this series of photographs shows the tools and technologies used in the processing and preserving of salmon, such as axes, hoses, containers, knives, sharpeners, and the smokehouse. Also shown are the animal and natural resources at the heart of this activity: wood for generating smoke and heat, harvested from the land on Musqueam territory; and salmon, lifeblood of Musqueam people, harvested from the Fraser River. snəw̓eyəɬ (teachings) guide how these technologies are used to feed and sustain Musqueam families. 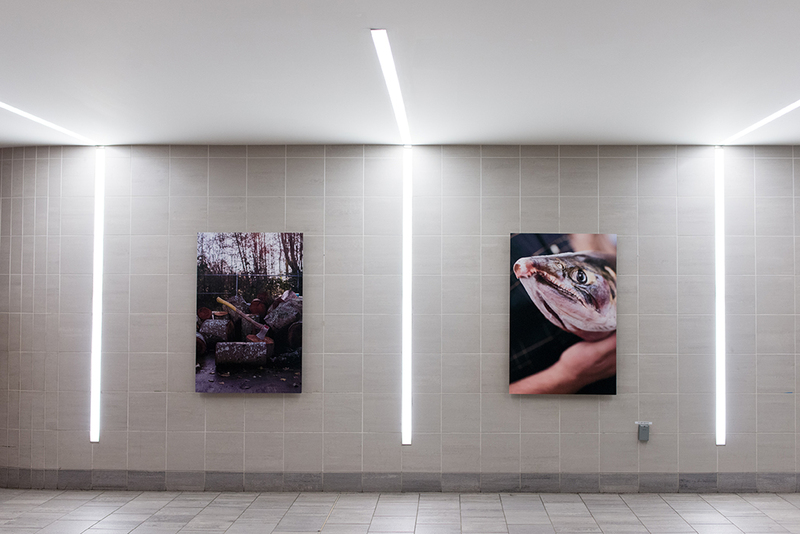 Salmon and their life cycles have been intricately connected to Musqueam life ways for millennia, and the ancestral knowledge that has stewarded salmon and the river itself continues to be shared today. These images are an expression of cultural survival and resilience. This work has been curated in relation to the theme of ćәsnaʔәm, the city before the city, an exhibition developed by the Museum of Vancouver, the Museum of Anthropology, and the Musqueam Cultural Education Resource Centre. Thanks to InTransit BC. 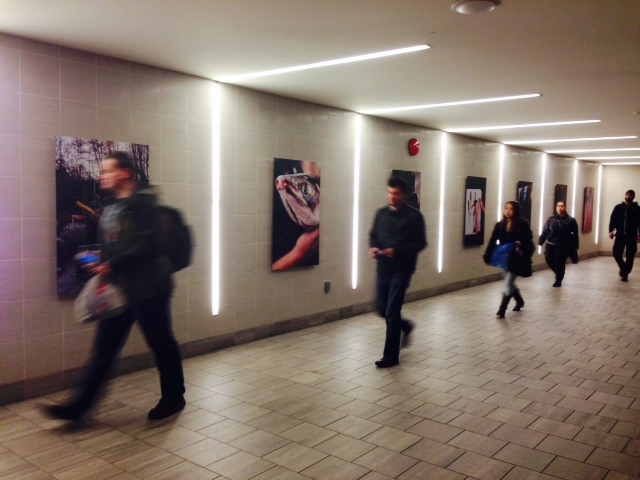 snəw̓eyəɬ (teachings) is on display through April 2015 in Waterfront Station in Vancouver as a part of the Capture Photography Festival. Photo by Kate Hennessy, 2015.